The physical existence was not created to be overwhelmed and shattered, but to be developed into a "dwelling for G-d", a place where the Divine Presence is 'at home' and freely expressed. Thus, the mitzvos were given to be acted out within the natural world - so that man utilize his own natural powers and the natural resources of his environment to implement the will of G-d. So a mitzvah that is performed in a 'spiritual' manner, a mitzvah that is disconnected from our worldly reality, is lacking the basic function of the mitzvah: to develop the natural world, as it is, as a vehicle to express the all-pervading truth of its Creator. 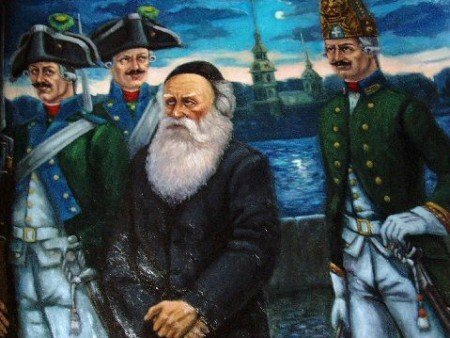 During his imprisonment by the czarist regime, Rabbi Schneur Zalman of Liadi was held in the Peter-Paul Fortress, situated on an island in the Neva River in Petersburg. The investigation into his 'crimes' was being conducted by the czar's intelligence organization, which was housed in a building on the mainland. So Rabbi Schneur Zalman was frequently ferried across the river for questioning. One night as the small boat was making its way across the Neva, the sky cleared and a quarter moon illuminated the skies. Rabbi Schneur Zalman, wishing to avail himself of the opportunity to 'sanctify the new moon' (Kiddush Levanah),1 asked the official in charge to stop the boat. The official refused. Suddenly, the boat came to a complete halt. Nothing the ferryman could do would advance it a single oar-sweep. The Rebbe stood up in the boat and recited the first few verses of psalm 148 which prefaces the blessing on the moon. But Rabbi Schneur Zalman refused to perform a mitzvah by availing himself of more then natural means. So he released the boat, allowing it to continue on its way. Again he requested of the official that the boat be stopped. Only after his request was granted and the boat came to a natural standstill did he proceed to perform the mitzvah of Kiddush Levanah. 1. The Jewish month follows the moon's phases. The moon's wax and wane, its dwindle to nothingness and inspiring rebirth, reflects the saga of Jewish history: we, too, have had our ups and downs, rebounding time and again from crushing defeat to glorious renewal. In the words of the Talmud (Sukah 29a), "The people of Israel emulate the moon, calculate their months by the moon, and are destined to be renewed as she is. "So every month, we celebrate the affinity between the Jewish nation and its alter-ego, the moon. Standing under the moonlit sky, we say: "Blessed are You G-d… Who, by His word, has created the heavens, and by the breath of His mouth, all their hosts… and to the moon he said: "renew!" - a crown of glory to [the Jewish people] who are destined to be renewed as she is." The proper time for the blessing is at the start of every month in the Jewish calendar (preferably between the 7th and the 15th of the month).